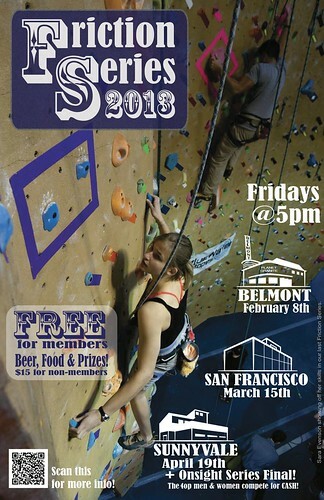 Planet Granite | Friction Series 2013 starts in February! The Friction Series is our Spring Roped Climbing comp held at each of our locations with an Onsight Final to conclude the events. Running for the 5th year in a row, the Friction Series is a fun community event where everyone can test their skills and watch others climb! Best yet, the final comp in PG Sunnyvale hosts the Onsight Series Final which takes the top 3 men and women who compete for cash prizes on challenging lead routes. Open to all abilities, and fun for all ages – it’s a Friday night at PG you won’t want to miss! Open (lead only): 5.11d and higher. The top 3 scores of the entire comp will be invited to pariticpate in our Onsight Series Final at PG Sunnyvale! This is not cumulative scoring, so if your score at PG Belmont beats out the top scores from PG Sunnyvale and PG San Francisco, you’ll be invited! Witness the best climbers duke it out high above on ropes in an action packed, breath holding event! Even better – the routes will be left up after the comp so you can test your skills against the best.